The final assault on the last Islamic State enclave in Syria slowed down after the discovery that ISIS was using civilians as human shields. Syrian Democratic Forces (SDF) commander Mustafa Bali acknowledged the operational slowdown in a tweet, but reaffirmed that "the battle to retake the last ISIS holdout is going to be over soon." We’re slowing down the offensive in #Baghouz due to a small number of civilians held as human shields by Daesh. However we assert that the battle to retake the last ISIS holdout is going to be over soon. On Saturday,President Donald Trump reflected U.S. optimism that the ISIS-held town of Baghouz would be retaken quickly telling the Conservative Political Action Committee (CPAC) that by "today or tomorrow, we will have 100 percent of the caliphate defeated." The SDF resumed the offensive on Baghouz Friday after they had paused for more than a week after an estimated 10,000 civilians and ISIS families fled the town. The SDF screened the civilians as they left Baghouz to ensure that there were no ISIS fighters fleeing with them. The number of civilians in the town was a surprise to the Kurdish fighters and U.S. military officials. 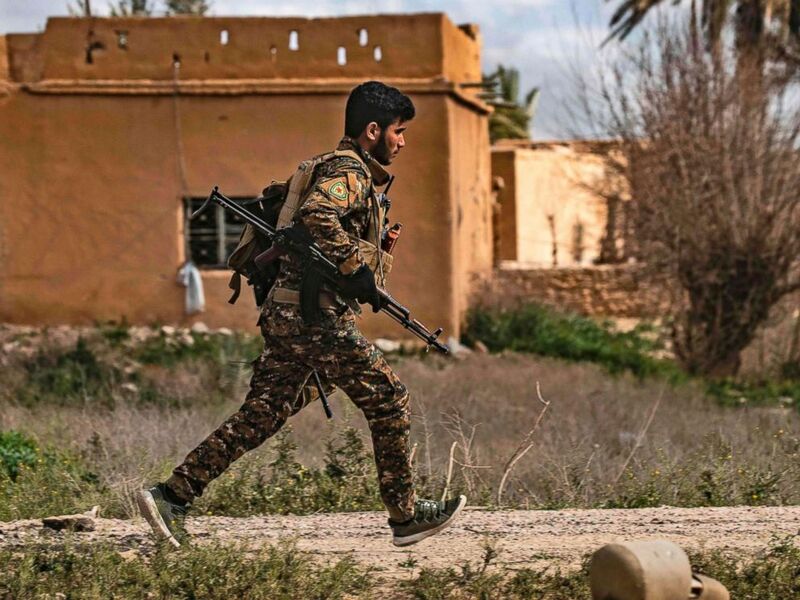 A member of the Syrian Democratic Forces (SDF) runs for cover during shelling on the Islamic State group's last holdout of Baghouz, in the eastern Syrian Deir Ezzor province, March 3, 2019. The move was in line with a previous Kurdish decision to slow down the offensive after they were surprised by the large number of civilians in the ISIS-held town. American officials praised the SDF for being deliberate in its offensive to ensure there were no civilian casualties. Two weeks ago, the Trump administration authorized "roughly 400" U.S. troops should remain in Syria. In December, the White House announced that all 2,000 U.S. troops were to leave Syria. The force of about 400 will serve as part of an observer force, composed of troops from the U.S. and other partner nations to provide stability in Syria. They will primarily assist with stabilization efforts after an ISIS defeat and also as a check on any Turkish aggression against Syrian Kurds.